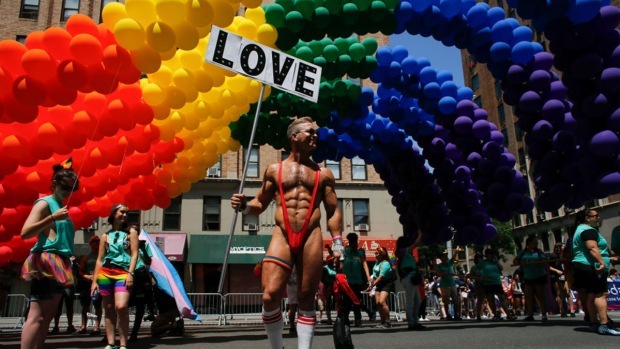 Celebration and pride mixed with defiance in New York City on Sunday as throngs of people crowded the streets, rainbow flags waving, for the annual gay pride march. Tennis legend Billie Jean King was one of the grand marshals, along with transgender advocate Tyler Ford and civil rights organization Lambda Legal. 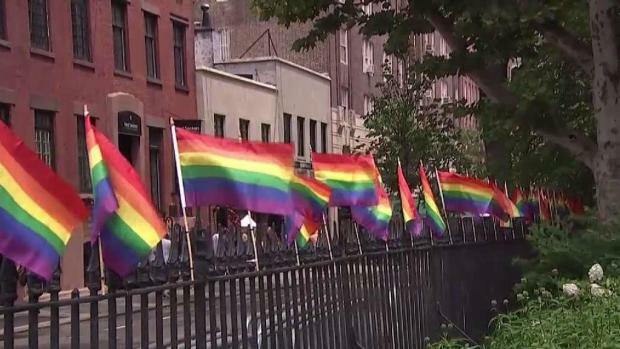 The event, and others like it around the country, commemorated the riots that erupted in response to a police raid at a New York gay bar called the Stonewall Inn in June 1969. The march passes by the Stonewall National Monument before heading up Fifth Avenue. It kicked off at noon at 16th Street and Seventh Avenue. See the street closures here. Onlookers and participants in New York noted those origins at Sunday's event, which was both a celebration of the diversity of LGBT culture and a statement against anti-LGBT policies promoted by President Donald Trump, such as the Republican president's attempt to ban all transgender people from serving in the military. They also spoke out against policies aimed at other communities, like immigrants and minorities. 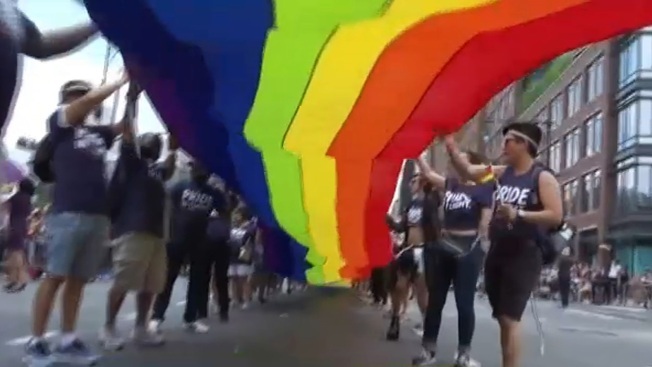 The final preparations for the New York City Pride March are underway. Lori Bordonaro reports. "We're making a statement that we're here, everybody. Whether it's immigrants, whether it's queer people or people of color, we're not going to put up with what this administration is doing," said Diego Molano, of Queens, at his second pride parade. "You can't just cage everybody up." Olivia Nadler, a Connecticut resident attending her third parade, said "people that are oppressed are not going to go away, they're not going to be quiet, they're not going to be ignored." Among the signs people were carrying in the parade were phrases like, "Black and brown and trans lives matter" and "No more guns." Ohemaa Dixon, 20, from Brooklyn, teared up as she spoke about what the parade meant to her and the joy she felt in seeing everyone come out to attend. "It's okay to be who you are and love who you love and dress how you want to dress and do what you want to do because I think it's so important to be who you are and who you love," she said. "I'm getting emotional about it because I think it's so beautiful when people are who they are. That's why I love coming to these things. I think it's really cool that people come and they are exactly who they want to be." Elected officials, including New York Gov. Andrew Cuomo and New York City Mayor Bill de Blasio, both Democrats, were among those attending the march. Before it started, Cuomo officially unveiled a New York state memorial to lesbian, gay, bisexual and transgender people that honors victims of intolerance. Placed in Hudson River Park, it has nine boulders with pieces of glass installed in them that can act as prisms and reflect rainbows in sunlight. Cuomo formed the commission to come up with an LGBT memorial after the Pulse nightclub shooting in Orlando that left 49 people dead. The theme of this year's march was "Defiantly Different." Eighty floats and tens of thousands of marchers were expected. In San Francisco, a weekend of gay pride events was finishing with the Lesbian, Gay, Bisexual, Transgender Pride Parade and March through the city. Organizers expected large crowds for the event, which included more than 240 contingents. This year's theme was "Generations of Strength.